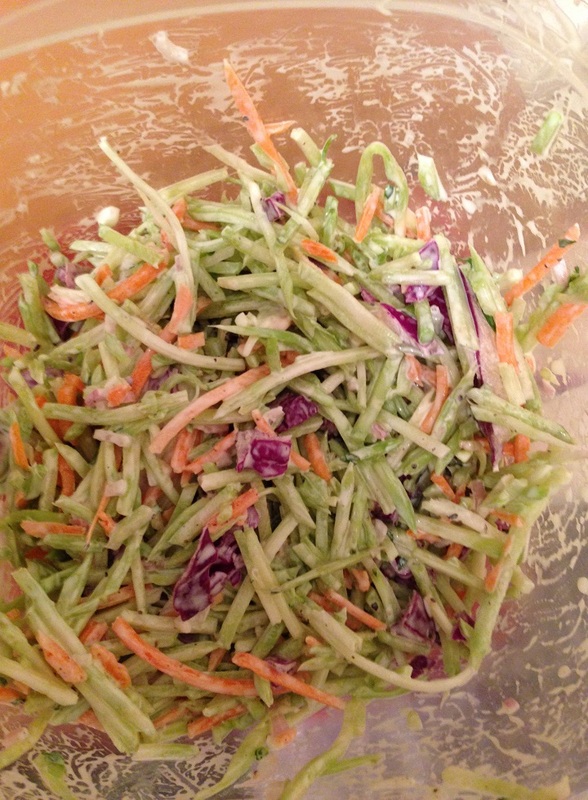 I know for many it may not seem like a coleslaw time of year and it might be something you only consider to be a summertime dish to go with your picnics and cookouts, but I like to have coleslaw just about any time of the year and I am always trying all different kinds. Coleslaw is a pretty versatile side dish that can go great with hamburgers and hot dogs for sure, but I really like it with all types of pork and chicken dishes. I often make it when we are just going to have sandwiches for dinner as an easy side dish. As I said I try to do different things with it, using different cabbage or changing up the dressing so it has mayonnaise or without mayo for more of vinaigrette style, but I also really like to try broccoli slaw now and then. Broccoli slaw is basically shredded broccoli and carrots and cabbage mixed together to get a unique flavor. You very often see it in the produce section of your store by the other bagged coleslaw options, though you could certainly make your own mix if you like. Last time I was at the store I decided to pick up a bag and give this recipe a try from Add a Pinch for a very simple broccoli slaw. Pour the broccoli slaw into a large bowl and add the chopped red onion. In a 2-cup measuring cup, add the mayonnaise or yogurt, the apple cider vinegar, the sugar and the lime juice. Whisk the ingredients together with a fork or whisk and then pour about half of the dressing over the broccoli slaw in the bowl. Toss the slaw together to make sure it has all become well-dressed. Add any additional dressing as may be needed. Season the slaw with salt and pepper to taste and mix the slaw together well. Add the chopped parsley as a garnish, if using, and serve the slaw with any remaining dressing on the side. You can easily make this ahead of time and store it in the refrigerator for a couple of days if you are planning to use it for a party or to take to someone’s home as part of a meal or a buffet. 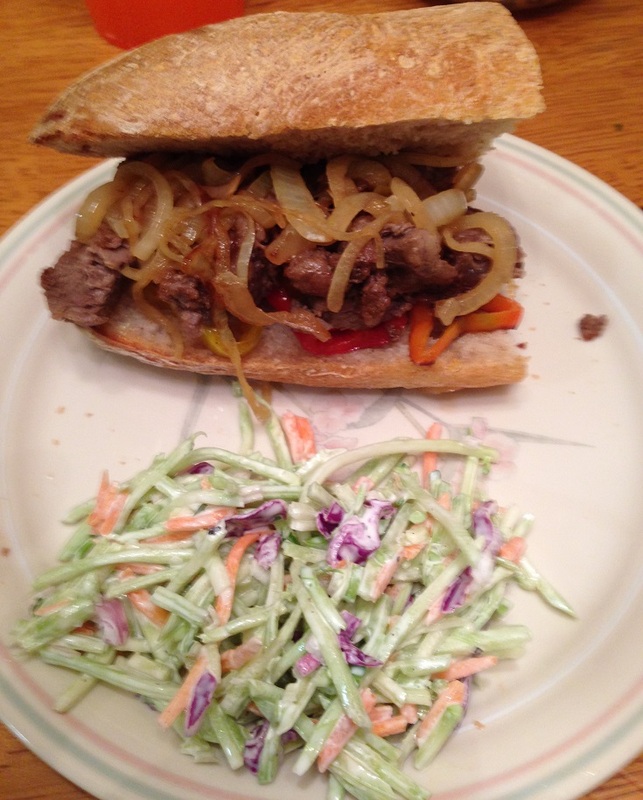 It goes really well with any type of sandwiches and I first served it with the steak sandwiches that we made recently and it was perfect. We have also used it for a side dish to go with lunches for the week and it goes really well with dishes like spare ribs or pulled pork, where you can put it right on the pulled pork sandwich as a topping. It is definitely easy and gives you a nice alternative to traditional coleslaw recipes. That’s all I have for today. Check back next time for another recipe. Until then, enjoy the rest of your day, have a happy and safe Halloween and enjoy your meal (and your candy too!). Sean has been asking me for months now to try my hand at making some homemade tater tots. Tater tots are pretty much a religious experience around my home and Michelle and Sean absolutely love them. When we have burgers, it’s always with tater tots. I have looked at recipes for homemade tots before and they always seemed very involved and difficult and didn’t look like they would really turn out all that great so I stayed away from them. A few days ago I saw this recipe from Bon Appetit and read through it and could not believe how easy it would be, so I knew this was going to be the time I would try it out. For the spicy mayonnaise, combine the mayonnaise, adobo sauce, hot pepper sauce, and paprika, if using, in a small bowl; season the mayonnaise with salt and pepper to taste. For the tater tots, preheat the oven to 400 degrees. Prick the potatoes all over with a fork and bake them directly on an oven rack until the potatoes are very soft when they are squeezed, about 60 to 75 minutes. Let the potatoes cool slightly so they are easy to handle. 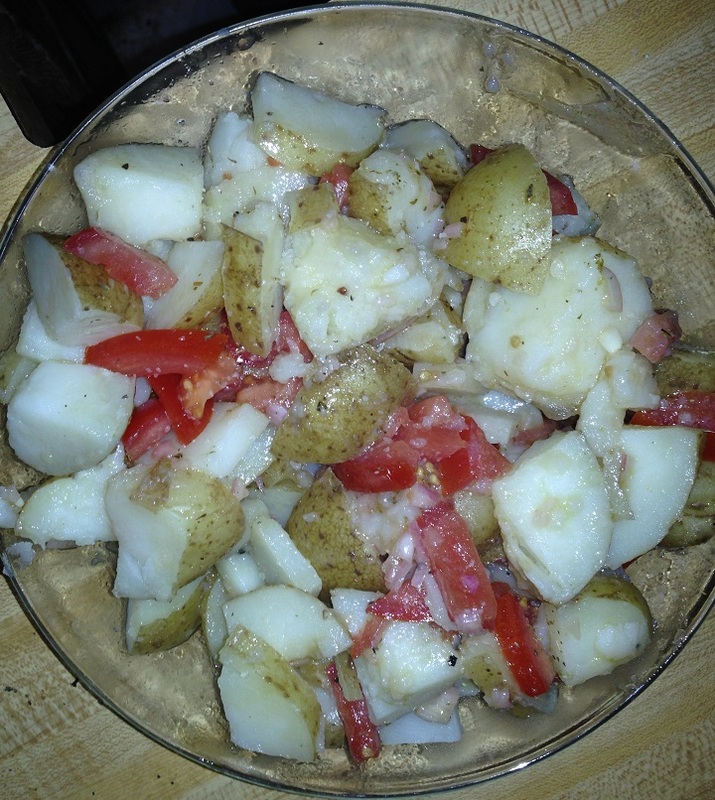 Cut the potatoes in half and scoop the flesh into a medium bowl; discard the potato skins. Mash the potatoes, then mix in the scallions, breadcrumbs, cream, sour cream, butter, granulated garlic, pepper, 2 teaspoons of salt, and 2 tablespoons of Parmesan cheese. Mix in the eggs until they are just combined. 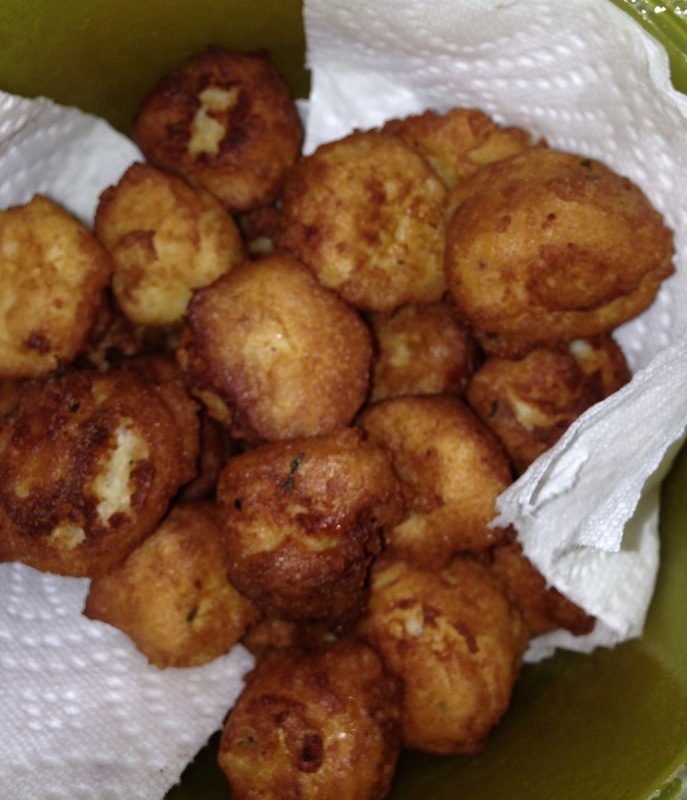 Roll 1-tablespoon portions of the potato mixture into balls. Pour the vegetable oil into a medium skillet to a depth of ½-inch and heat the oil over medium heat until bubbles form immediately when a little potato mixture is added. Working in batches, fry the tater tots until they are a deep golden brown, about 3 minutes per side. Drain the tater tots on paper towels. Season the tater tots with salt to taste and serve them with the spicy mayonnaise. I did do one thing that is not included in the recipe that does seem to make a difference, at least to me. After I rolled the tater tots (and I used a cookie scoop to roll them, the medium-sized one) I put them on a plate and put them in the refrigerator for 30 minutes. This seemed to firm the potatoes up nicely so they really held their shape well and went into the oil easily and did not fall apart along the way. I have to say while they are not exactly like the frozen tater tots you buy in the store, they are much creamier and have better texture. It kind of tastes like a deep-fried mashed potato, which for us was fantastic. They were really easy to make and came out perfectly for me and I think it made about 30 to 40 tater tots, which was plenty for us. It takes a little longer than opening up the bag out of the freezer but in my mind it is worth the effort to make them. I am always on the lookout for different meatball recipes. It is just one of those meal items that I like to tinker with and I am looking to add new flavors to meatballs to jazz them up a little bit. Whether it is for a simple meal with spaghetti in tomato sauce, as an appetizer for a buffet or party, to have in gravy over rice or noodles or to make a nice sub or sandwich meatballs are one of those things that you can do a lot of things with and make them in wide variety of ways with many different ingredients. I came upon this recipe from Alton Brown for meatball sandwiches on Parmesan parsley biscuits and thought it sounded great, but to me they are perfect meatball sliders for an appetizer, party or dinner. it’s a very easy recipe that gives you some basic meatballs with great tasting biscuits and a nice spaghetti sauce to boot. For the meatballs,in a large bowl, combine the beef, pork, veal, egg, onion, parsley, garlic, oregano, salt, and pepper and mix all of the ingredients until they are well combined. Scoop the mixture into mini muffin tins or onto a wire rack set over a rimmed baking sheet. Bake the meatballs until they are browned and cooked through, about 15 to 20 minutes. In a large bowl, combine the flour, 1/2 cup of the Parmesan, sugar, baking powder, salt, and pepper. Whisk until everything is well blended. Add the butter and combine the mixture with your fingertips until a coarse meal forms. Mix in the parsley. Gradually add the milk, tossing the mixture with a fork until moist clumps form. Add extra milk if the mixture is too dry. Put the dough on a floured work surface, folding 8 to 10 times until it becomes firm. Let the dough rest for 10 minutes under a damp towel. Roll out the dough on a lightly floured work surface. Using a 2-inch-diameter biscuit ring, cut out the biscuits and put them on a parchment paper-lined baking sheet. Sprinkle the tops of the biscuits with the remaining 1/2 cup of Parmesan cheese and bake until the biscuits are puffed and golden, about 15 minutes. For the spaghetti sauce, in a medium pan set over high heat, saute the onion and the garlic in olive oil until both are softened, about 3 minutes. Add the tomatoes and allow the mixture to simmer until it is slightly reduced and thickened, about 25 minutes. Stir in the fresh basil just before serving. 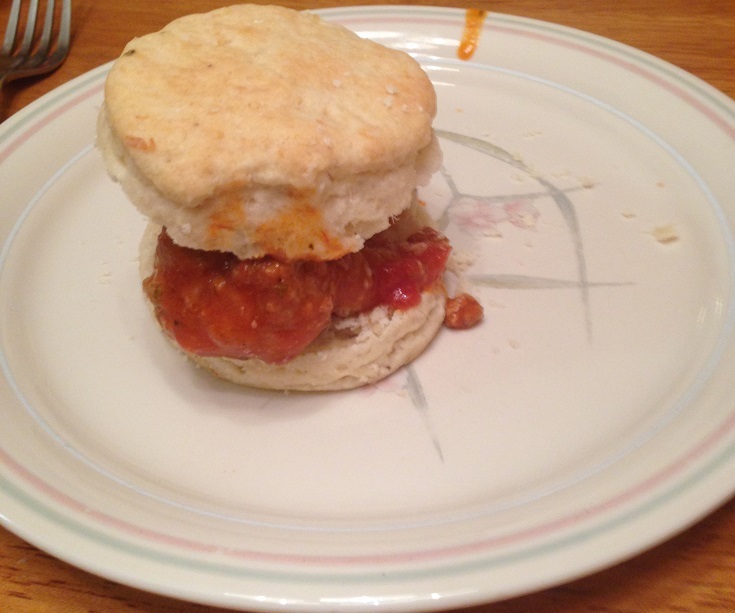 To build the sliders, slice a biscuit in half and place a meatball on the bottom half of the biscuit. Cover the meatball with as much spaghetti sauce as you like and top each meatball with a slice a provolone cheese. Place the biscuit top on top of the meatball and continue until all of the biscuits are filled. I have to say I really liked these. While the meatball recipe is very basic, it does taste good and produces a moist meatball that goes well with the sauce. The real star of this one I think is the Parmesan biscuit, which comes out perfectly and goes really nicely with the meatballs as a slider. The biscuit has great flavor and is really easy to make so you can make this to go with other meals besides this one. we even used some to make breakfast sandwiches with some bacon or sausage and egg. Of course the meatballs and sauce can be for anything that you would use meatballs for as well besides just sliders if you want a nice, basic and easy meatball recipe. It’s been pretty rainy and chilly here in our part of New York this week, so much so that the heat actually kicked in and came on the other morning, letting me know that the colder weather is rapidly approaching. It means I spend the early morning hours wearing my sweater around the house while I type away about various topics for my writing, covering everything from dental offices and travel tips to Thailand vacation spots and video gaming. Work has been busy lately and since the weather is cooler it is the perfect time to break out the slow cooker and make some soups or stews. 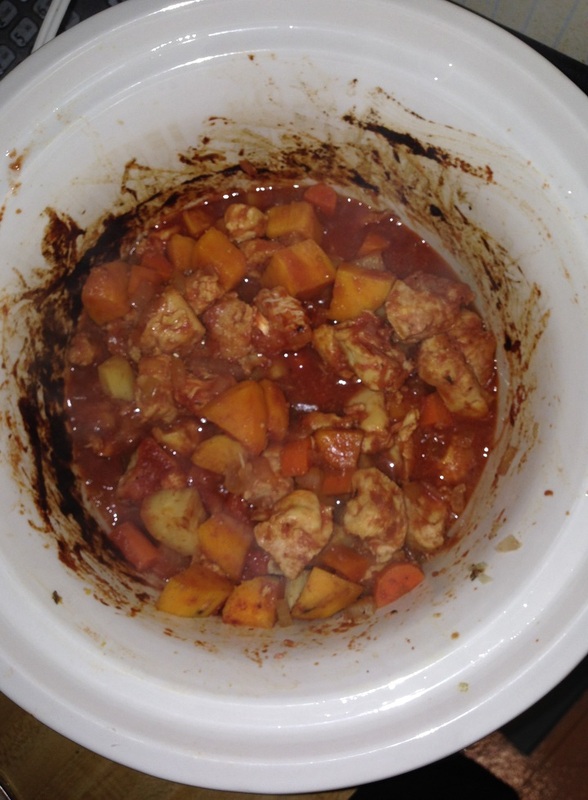 This seemed like the perfect time to make this recipe from Cooking.com for chicken, carrot and sweet potato stew, a nice, thick, hearty stew that was easy to put together and has some great flavors to it. Place the chicken, sweet potatoes, carrots, onion, minced garlic, tomato paste, white wine, thyme and bay leaves into the slow cooker. Stir the ingredients to combine everything well. Cover the slow cooker and cook the ingredients on low for 5 hours or until the vegetables are tender and the chicken is cooked through. Remove the bay leaves and put the stew into a large bowl or serve right from the crock of the slow cooker. Believe it or not, that’s all there is to this recipe. 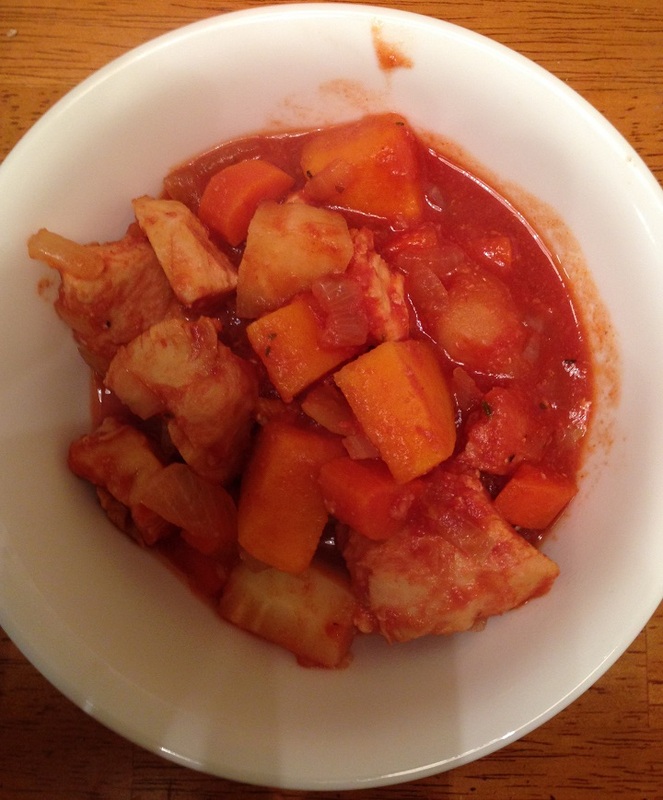 It is very simple to put together and gives you a nice stew with a great tomato-based broth. I added in a couple of diced and peeled parsnips that I had on hand to get a little bit of extra flavor in there as well and I think you could pretty much add any fall vegetables that you really like, such as some diced butternut or acorn squash, to go along with the meal. 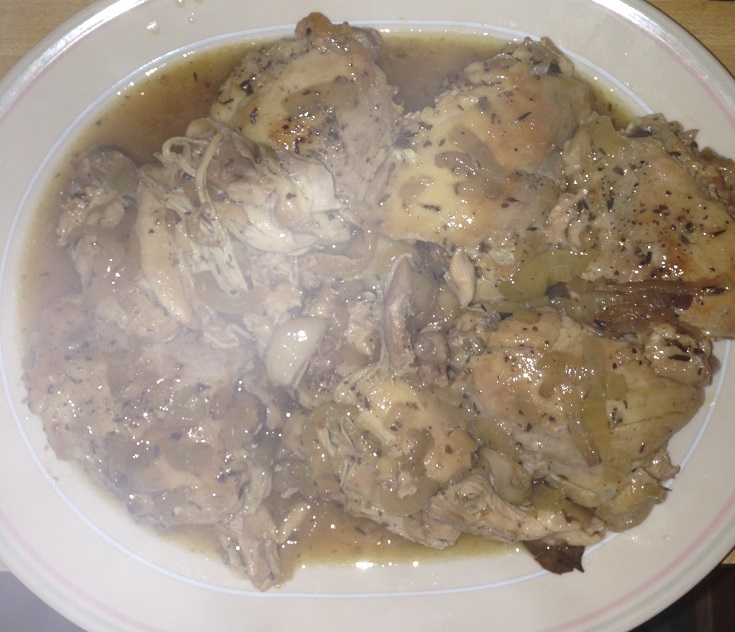 You could always use chicken broth or water in place of the white wine if you did not want to use the wine and I think you could even substitute skinless, boneless chicken thighs for the breast meat if you prefer the dark meat or even use some stew beef instead of the chicken if that is what you prefer. Whatever you decide, it is a nice and simple mix that you can put in the slow cooker early in the day, set about your business and then have a great stew for dinner. I served this with some of the not quite whole grain baguette that I had made and it was perfect. That’s all I have for today’s recipe. Check back next time for another new recipe and see what’s cooking. Until then, enjoy the rest of your day, stay dry, and enjoy your meal!